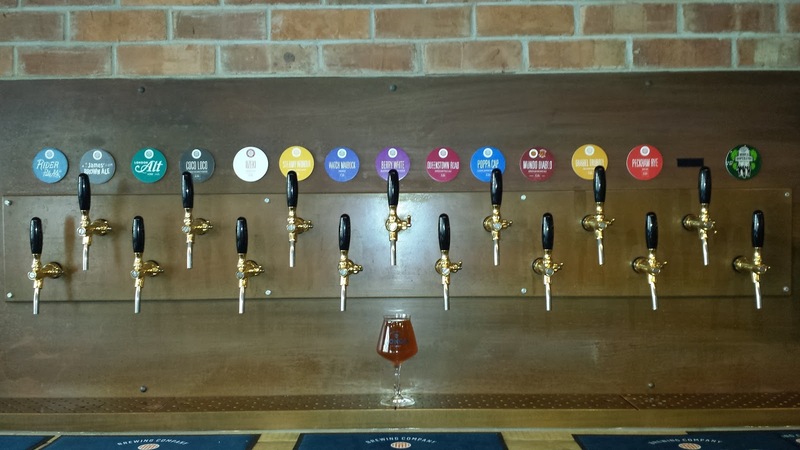 Mondo Brewing Co – MostlyAboutBeer…….. Yesterday was a perfect autumnal day to go and seek out a new brewery. 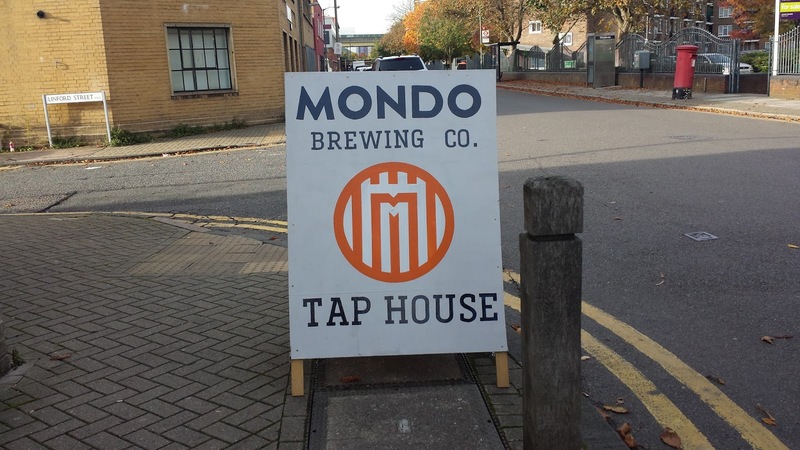 By all accounts, Mondo has opened with a statement of intent boasting 15 taps! 13 were available on Sunday as Australia beat Argentina at rugby in the background (not actually in the brewery itself but on the flat screen tv). I usually get lost tracking down a new brewery but Mondo could clearly be seen from a distance. 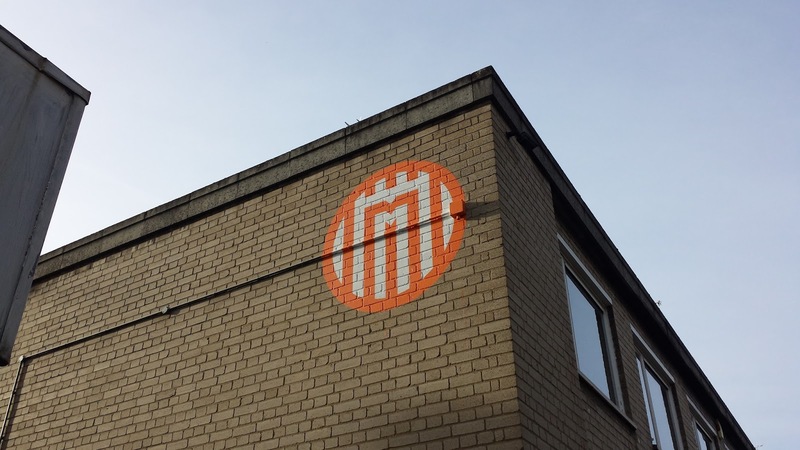 The logo has been emblazoned on the side of the building. This brewery has started with one of the highest brewing capacities I’ve known from a start-up – 27 hectolitres. The gleaming coppers are housed adjacent to the taproom. Mondo also buys whole grain for the malt – not common among the capital’s breweries. All its beers are served via standard keg or in bottle. The beer styles reflect an entire planet hence the name – Mondo. Up until quite recently, new breweries would open up with a tiny core range – a bitter, a stout and a pale ale. IPAs started gate crashing and muscling in to make the mandatory line-up. Then came the resurgence of porters fostering nervous looks from the stouts. Then there was rye, then there were sours, then the walls fell away. Brewing is the best it’s ever been in this country as increasingly, there are no restrictions in what the beer should be. 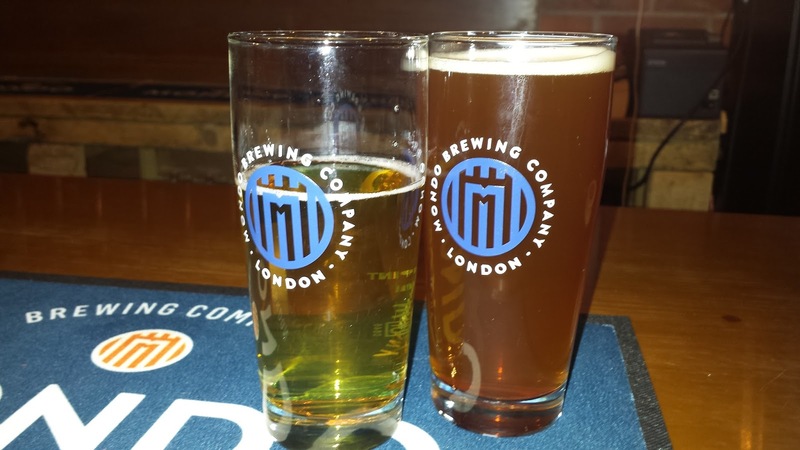 This brewery has London’s whole back catalogue behind it. It’s a marker to where brewing has got to. I don’t believe a business like this could even have been contemplated a couple of years ago. In the 13 beer salute, there were pale ales, American brown ales, an Alt, a smoked coconut porter, a steam lager, a Maibock, A Blackberry Berliner Weisse, a rye ale, an American IPA and a Belgian style Dubbel. The white flesh of coconuts really give this porter character. I can almost feel the gnashing of it as it gives up its sweet tuber juices. It refreshes what’s generally a dark roast sipping beer. A blackberry Berliner Weisse – a slightly opaque beer (though much clearer than the style might imply). Your tongue licks a sticky blackberry compote from the lips. Then it dives into a deep fruity but astringent Berliner Weisse with a zingy lemony dry finish. Fusty aroma like varnish or cherryade. Salty grainy friction to the mouthfeel. Generous malt dimension verging on caramel or brandy. It tastes matured. It’s a beer you can roll around your tongue. Tangerine orange with a tight lily head. Honey/vanilla/peach aroma on a gentle body. It completely belies its strength. Lemon drizzle cake/vanilla sponge malt pillow. It’s mellow and smoothed out everywhere like clean linen. Clear golden yellow. Notes of banana, grass and vanilla. Smooth & malty with a visible carbonation that stays gentle on the palate. It’s peachy and as clear as crystal. dark orange ale with a pale swirling hop oil constellation. Slightly cloudy (or quite dark in the taproom). Elastic & gingerloafy body & taste. Full of dark Christmas spices. Dark berries ferment on the tongue. I purchased a glass which I put in my rucksack which I immediately knocked off the stool and it smashed. The second glass made it alive back to St Albans with me. I urge everybody to visit Mondo Brewing. Great guys. Great beer.